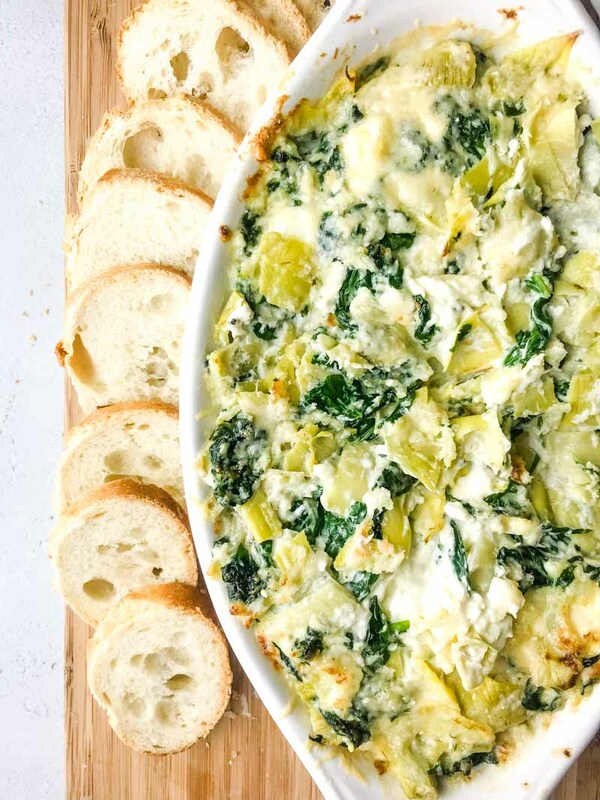 Decadent Hot Crab Spinach Artichoke Dip is a must for parties this season! 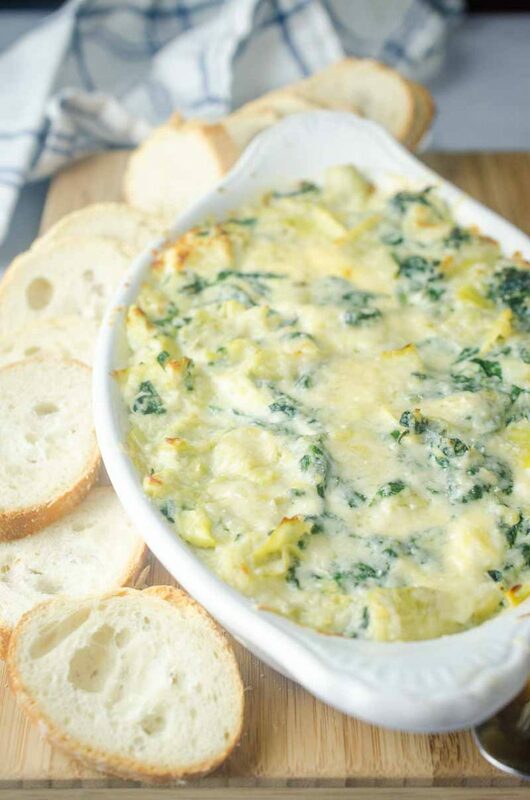 If you love spinach artichoke dip, you will love this version with crab! With the holidays fast approaching, I thought it was time to revisit one of my favorite holiday foods: dips. Truth be told, the dips and spreads at parties are always where you will find me. I’ll be munching on french onion dip, or cranberry rosemary spread and oh, man, hot dips. I love them too. Specifically this Hot Crab Spinach Artichoke Dip. 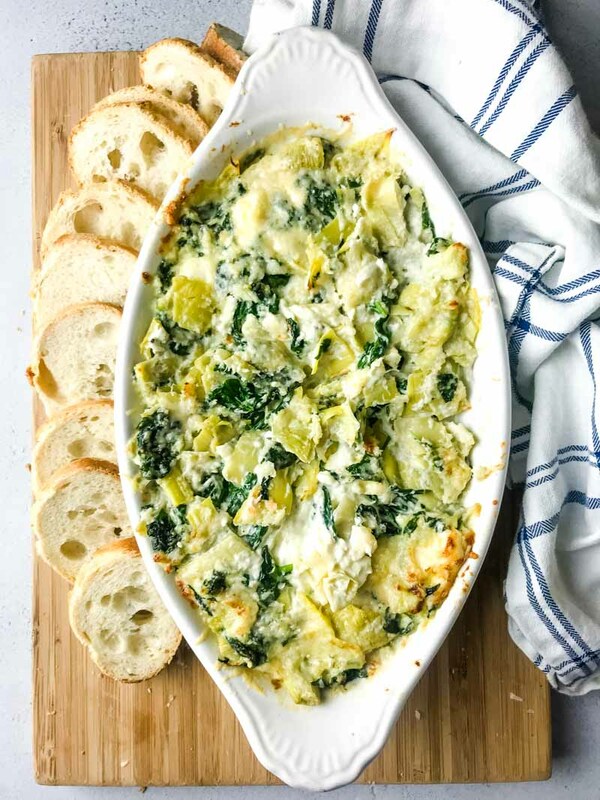 If you love spinach artichoke dip (and spinach artichoke stuffing! ), and you love hot crab dip, you are going to love this mash up. 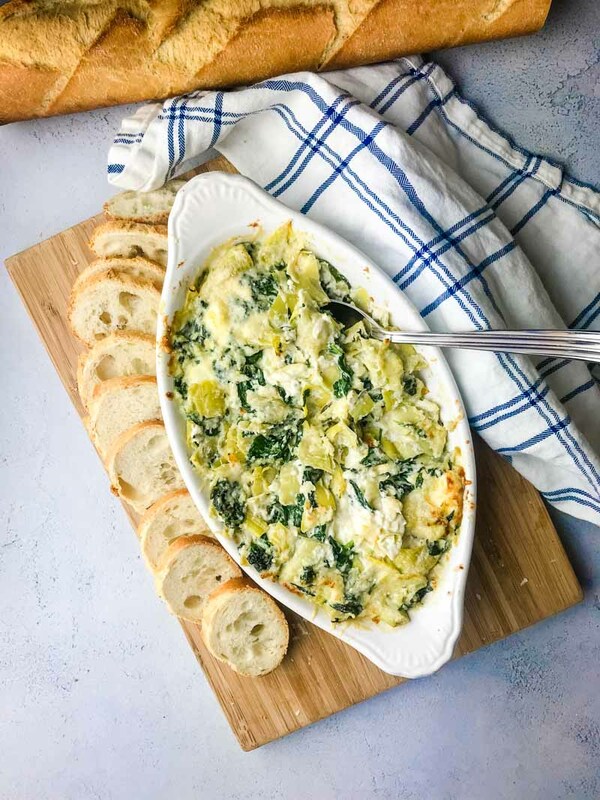 Hot Crab, Spinach Artichoke Dip is going to be a must make for your holiday parties. One of my favorite things about food is the memories that often surround certain dishes. 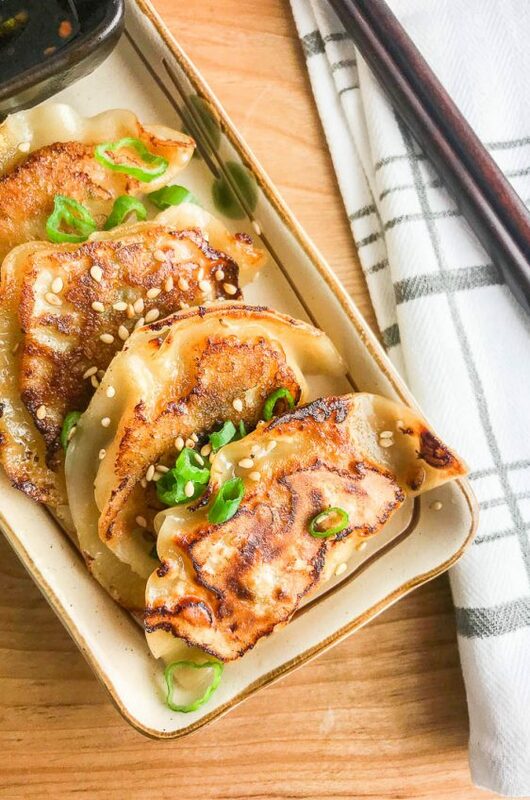 There are probably a few favorite dishes of yours that when mentioned make you think back on certain moments in your life. Maybe a big family get together, your first date, holiday parties or your visit to the stadium for your first major league baseball game. 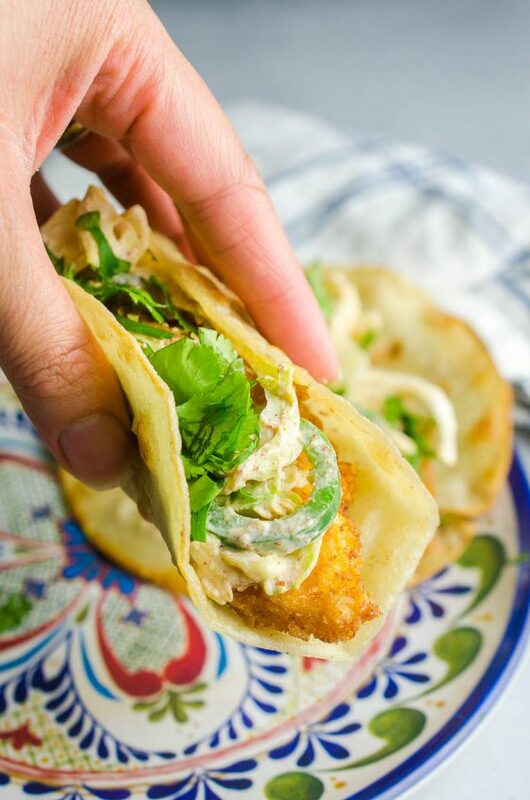 I have a few favorite dishes that bring back memories too. 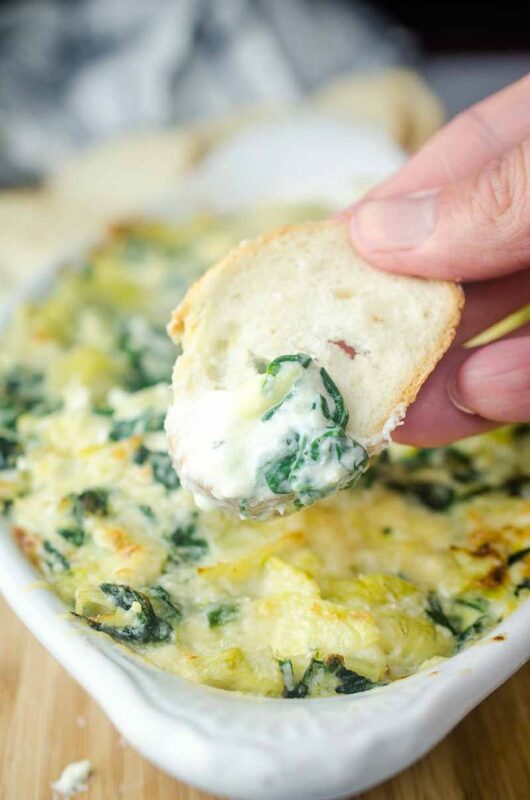 Take this Hot Crab, Spinach and Artichoke dip. It is one of my favorites because it is chock full of artichokes, baby spinach, crab and two different kinds of cheese. But it is also a favorite because it comes loaded with memories of my very first job. My first job was at a restaurant. And unlike most first jobs, or restaurant jobs for that matter, I was there When I took the job, I didn’t expect that I would grow up there and come out of my shy girl shell. I didn’t expect to laugh so much at work and I didn’t expect that I would work with the same core group of people for the entire six years. And I didn’t expect that those people would become some of my best friends. When I moved away several years back, I didn’t expect to miss it as much as I did. 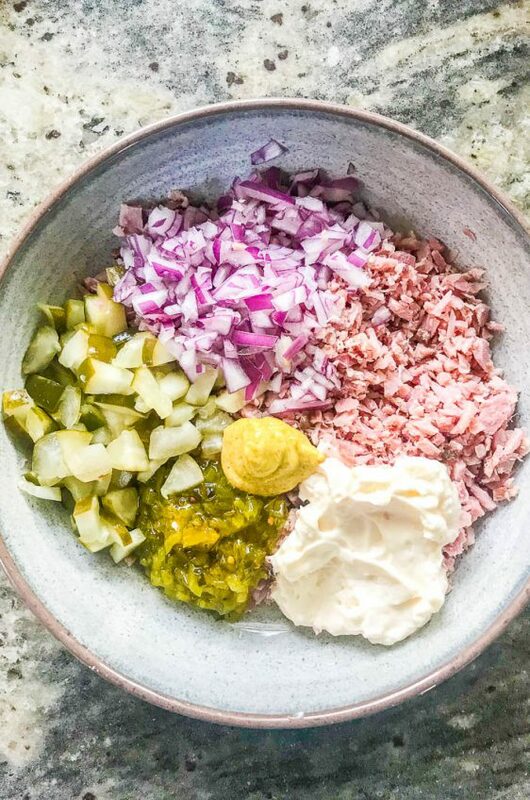 The restaurant has been closed for several years now, but every time I’m missing it, I make something that brings back memories, like this dip. Hot Crab and Spinach dip was always a part of my spiel. I recommend it because it was one of my favorite things on the menu. This recipe is inspired by that dip. 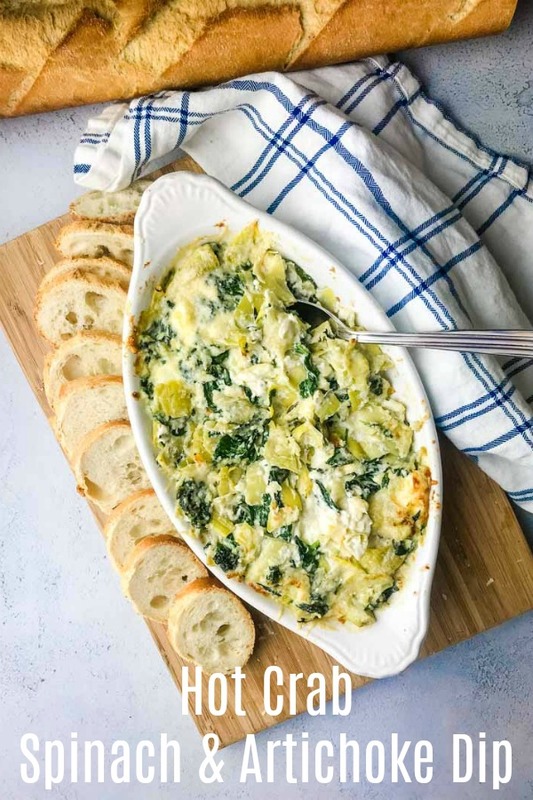 How do you make hot crab spinach artichoke dip? I like to use fresh spinach in this dip, rather than frozen or canned spinach. I also prefer to use fresh crab when it’s available. If you don’t have access to it, I’ve also made this dip with canned crab and it worked perfectly. To help with party planning you could even make the dip ahead of time and then bake it when you are ready. The original didn’t have artichokes but I added some because spinach and artichoke dip is always a favorite. 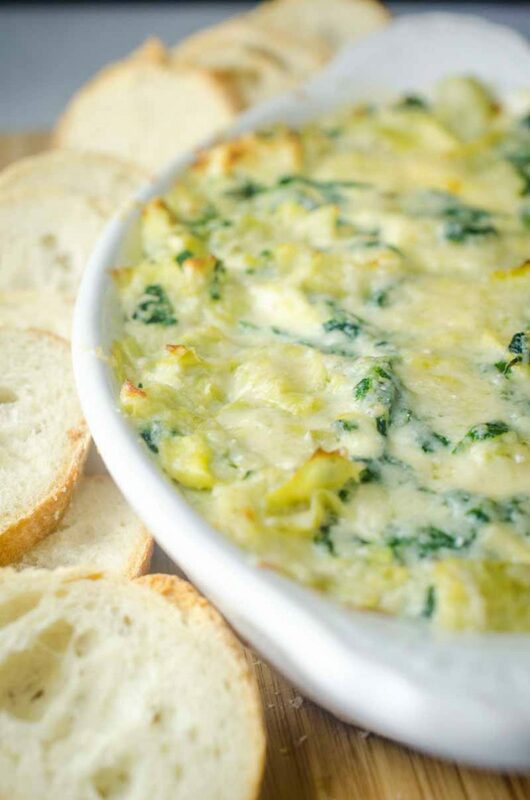 What do you serve with hot crab spinach artichoke dip? At the restaurant, we served this dip with fresh hot tortilla chips. I thought they were a great accompaniment but crackers or crusty bread are also a good option! Honestly, you could probably just hand me a spoon and I’d eat it that way too. No lies. Originally posted December 2009. Updated in 2018. In a small skillet melt butter over medium heat. Once butter melts add spinach and cook just until spinach wilts, about 2 minutes. Transfer to a mixing bowl. To the spinach add artichoke hearts, cream cheese, mayonnaise, 1/4 cup Parmesan cheese and crab meat. Stir to combine. Butter a small casserole dish, spoon mixture into the dish. Bake for 15 minutes. Remove from the oven, stir and sprinkle with remaining Parmesan cheese. Turn on the broiler and cook for 3-5 minutes or until top is browned and edges are bubbly. Allow to cool slightly and serve with tortilla chips. is this similar to the spinach crab artichoke dip you can get at Landry’s Seafood rest?? Do you think substituting the crab with lobster would work? I am definitely making this dip for my holiday party in a couple weeks! I can’t wait to try it! I LOVE the addition of crab! Seriously my perfect dip! Wow..artichoke and spinach in a creamy dip, I just need some crusty bread! Sounds lovely. What a great dip. Love that you added crab. It looks incredibly delicious! Oh my goodness! Crab? I love that addition! I have pinned this and will be making it for any holiday party I go to! I never thought of the intriguing crab + artichoke combo, so curious to give it a try! Spinach artichoke dip is my all time favorite dip, but adding crab to it? Even better! Wow this looks super delicious. I usually make this with only spinach and cheese. Never had this version with crab meat and artichoke. I definitely must try this. I LOVE that you added crab! What a great addition! I agree – this will be a great holiday appetizer! Can’t wait to try this one!! omg wow I just want to dip my bread through the screen! That dip is making me so hungry! Can you even call it a party if you don’t serve this amazing dip?? So good!! That cheese! Oh my goodness! I love it! I am sure that everyone in my family will love it, too! mmmm…this looks incredibly delicious!! I bet it tastes amaaazing!! I love spinach artichoke dip and you’ve taken it to another level by adding crab!! It looks so delicious and creamy and I must make it ASAP! YES….this is a must for all the holiday parties. 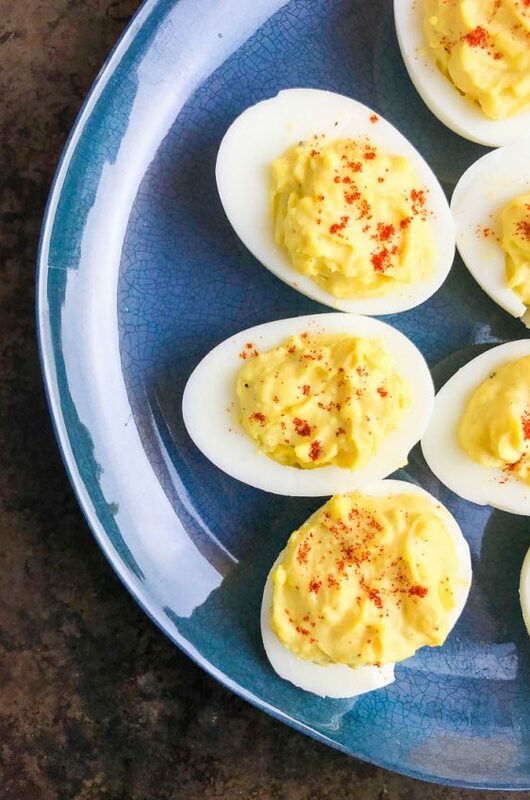 Easy to make, and all the guests will love it. You can never go wrong with great hot dips. 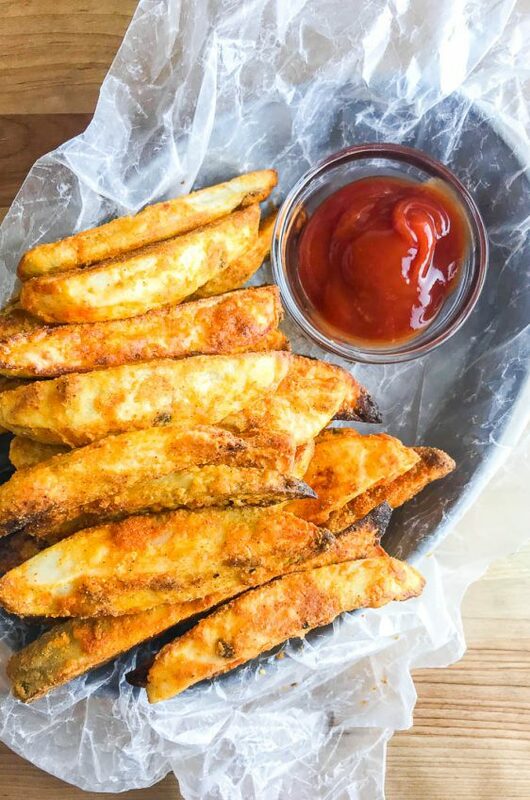 You can even use this as an appetizer too. This is a great recipe. I did a couple of variations because I was cooking for a office. I doubled my recipe, using 8 ounces of cream cheese 24 ounces of Spinach and 2 jars of artichokes, and 16 ounces of parmesan, I also added old bay, some minced garlic, salt, pepper, cayenne pepper, paprika, and because I didn’t have any mayo, I added horseradish sauce and 16 ounces of crab that I got for a great steal at $7.00 at Price Chopper. Doubled my cooking time and added a mixture of white cheddar and parmesan to top it off. Tried it with some blue corn chips. Absolutely Great. I’ll make some garlic pita chips next time I make it to go with it. So in other words…you completely changed the recipe? Oh Des, I loved this article! It brought tears to my eyes and brought up many memories of my own! Great website! That looks good! This is one of my favorite dips! I haven’t found a spinach/artichoke dip just yet that I really like. I’m going to give this one a try next! It looks great! Yummy! I am going to make this for the Christmas party this Friday. I will let you know how that goes. Thanks… love the pictures of all the food you make. Lovey story, sounds a bit like my own. Funny how we unexpectedly grow and progress huh. 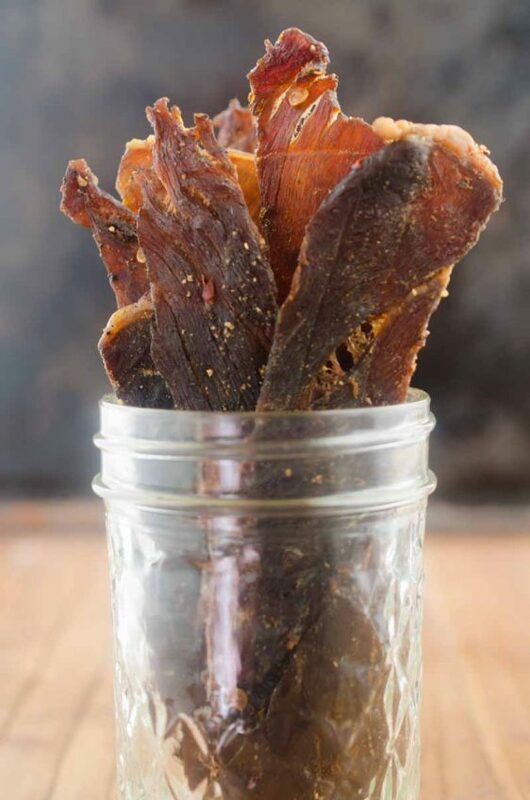 Your dip sounds so deliciuos I’m gonna try serving it on New Years Eve!